The university was the birthplace of insulin and stem cell research, and was the site of the first practical electron microscope, the development of deep learning, multi-touch technology, the identification of the first black hole Cygnus X-1, and the development of the theory of NP-completeness. It receives the most annual scientific research funding of any Canadian university, and is one of two members of the Association of American Universities outside the United States, the other being McGill University in Montreal, Quebec, Canada. Under Strachan's stewardship, King's College was a religious institution closely aligned with the Church of England and the British colonial elite, known as the Family Compact. Reformist politicians opposed the clergy's control over colonial institutions and fought to have the college secularized. In 1849, after a lengthy and heated debate, the newly elected responsible government of Upper Canada voted to rename King's College as the University of Toronto and severed the school's ties with the church. Having anticipated this decision, the enraged Strachan had resigned a year earlier to open Trinity College as a private Anglican seminary. 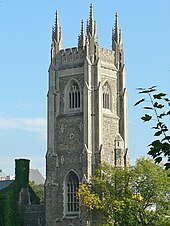 University College was created as the nondenominational teaching branch of the University of Toronto. During the American Civil War, the threat of Union blockade on British North America prompted the creation of the University Rifle Corps, which saw battle in resisting the Fenian raids on the Niagara border in 1866. The Corps was part of the Reserve Militia lead by Professor Henry Croft. In the 2018 Academic Ranking of World Universities rankings, the university ranked 23rd in the world and first in Canada. The 2019 QS World University Rankings ranked the university 21st in the world, and first in Canada. The 2019 Times Higher Education World University Rankings ranked the university 28th in the world, and first in Canada. In the 2019 U.S. News & World Report Best Global University Ranking, the university ranked 20th in the world, and first in Canada. 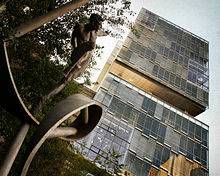 The Canadian-based Maclean's magazine ranked the University of Toronto first in their 2019 Canadian Medical Doctoral university category. The university was ranked in spite of having opted out — along with several other universities in Canada — of participating in Maclean's graduate survey since 2006. Along with academic and research-based rankings, the university has also been ranked by publications that evaluate the employment prospects of its graduates. In the Times Higher Education's 2018 global employability ranking, the university ranked 13th in the world, and first in Canada. In QS's 2019 graduate employability ranking, the university ranked 12th in the world, and first in Canada. In a 2013 employment survey conducted by the New York Times, the University of Toronto was ranked 14th in the world. ^ a b c "Quick Facts". University of Toronto. Retrieved October 12, 2018. ^ a b c "Who was an early advocate for higher education in Upper Canada?". History Q & A. University of Toronto Department of Public Affairs. 2002. Retrieved April 20, 2019. ^ "What university was founded 175 years ago?". History Q & A. University of Toronto Department of Public Affairs. 2002. Retrieved April 20, 2019. 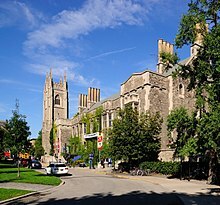 ^ "How does history remember the 1849 conversion of King's College to the University of Toronto?". History Q & A. University of Toronto Department of Public Affairs. 2002. Retrieved April 20, 2019. ^ a b "In what battle did the University Rifle Corps first see action?". History Q & A. University of Toronto Department of Public Affairs. 2002. Retrieved April 20, 2019. ^ "In 1878, what disciplines were launched in the University of Toronto's "Little Red Skulehouse"?". History Q & A. University of Toronto Department of Public Affairs. 2002. Retrieved April 20, 2019. ^ a b "What medical school was recognized as among the "best on the continent" within 20 years of its opening?". History Q & A. University of Toronto Department of Public Affairs. 2002. Retrieved April 20, 2019. ^ a b c "What was front page news in the inaugural issue of the student paper The Varsity in 1880?". History Q & A. University of Toronto Department of Public Affairs. 2002. Retrieved April 20, 2019. ^ a b "What was so heartbreaking about Valentine's Day, 1890?". History Q & A. University of Toronto Department of Public Affairs. 2002. Retrieved April 20, 2019. ^ "In 1914, why were students marching in the University of Toronto's Hart House under the command of a chemistry professor?". History Q & A. University of Toronto Department of Public Affairs. 2002. Retrieved April 20, 2019. ^ a b "How many University of Toronto students and alumni served in the Canadian Armed Forces during the Second World War?". History Q & A. University of Toronto Department of Public Affairs. 2002. Retrieved April 19, 2019. 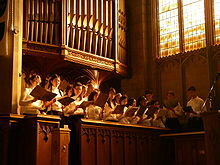 ^ a b "What theological college bucked the federation trend with the University of Toronto in 1888?". History Q & A. University of Toronto Department of Public Affairs. 2002. Retrieved April 20, 2019. ^ "What small town fought to keep its college from moving to Toronto and federating with U of T?". History Q & A. University of Toronto Department of Public Affairs. 2002. Retrieved April 20, 2019. ^ "What helped launch Slavic studies as a growth discipline at the University of Toronto?". History Q & A. University of Toronto Department of Public Affairs. 2002. Retrieved April 20, 2019. ^ a b c "Academic Ranking of World Universities 2018". ShanghaiRanking Consultancy. 2018. Retrieved August 18, 2018. ^ a b c "World University Rankings 2019". Times Higher Education. TES Global. 2018. Retrieved September 26, 2018. ^ a b c "Best Global Universities in Canada". U.S. News & World Report. U.S. News & World Report, L.P. October 29, 2018. Retrieved November 4, 2018. ^ a b "University Rankings 2019: Canada's top Medical/Doctoral schools". Maclean's. Rogers Media. October 11, 2018. Retrieved October 13, 2018. ^ "11 universities bail out of Maclean's survey". CBC News. Canadian Broadcasting Corporation. April 14, 2006. Retrieved March 12, 2019. ^ "World University Rankings By 2018". NTU Rankings. 2018. Retrieved November 3, 2018. ^ "2018-2019 RANKING BY COUNTRY". Informatics Institute of Middle East Technical University. 2018. Retrieved November 3, 2018. ^ "Graduate Employability Ranking 2019". QS Top Universities. QS Quacquarelli Symonds Limited. 2018. Retrieved March 10, 2019. ^ Pelley, Lauren. "Ryerson, U of T, York startup launchpads ranked among top university business incubators, accelerators". CBC. CBC. Retrieved February 28, 2018. ^ Murray, Andrew. "REVEALED! The World's Top University-linked Business Incubators & Accelerators 17/18". UBI Global. Retrieved March 6, 2018. ^ a b "Canada's Top 50 Research Universities 2018". Research Infosource. 2018. Retrieved March 12, 2019. ^ Rebecca Green (October 9, 1990). "College Songs and Songbooks". Thecanadianencyclopedia.com. Retrieved November 16, 2012. ^ Cheney, Peter (September 13, 2008). "Varsity Blues can't get no respect". Globe and Mail. Canada. Retrieved April 20, 2019. ^ "Varsity Blues topple Waterloo for first win since 2001". Globe and Mail. Canada. September 2, 2008. Retrieved April 20, 2019. ^ Ralph, Dan (October 13, 2007). "Varsity Blues set futility mark". Globe and Mail. Canada. Retrieved April 20, 2019. ^ "Delta Phi Nu Toronto". Archived from the original on December 13, 2014. ^ a b "What university theatre was the centre of the cultural universe (okay, in Toronto)?". History Q & A. University of Toronto Department of Public Affairs. 2002. Retrieved April 20, 2019. ^ "What made the "blood fairly boil" in U of T student and future prime minister William Lyon Mackenzie King in 1895?". History Q & A. University of Toronto Department of Public Affairs. 2002. Retrieved April 20, 2019. ^ "Enrolment Report 2016-17" (PDF). University of Toronto Planning and Budget Office. February 8, 2017. Retrieved October 29, 2017. ^ Harris, Kathleen (September 3, 2017). "Foreign students flock to Canada as government struggles to get grads to stay". CBCNews. Canadian Broadcasting Corporation. Retrieved March 4, 2018. ^ Xu, Xiao (September 27, 2017). "Climbing number of foreign students puts B.C. university's cap system to the test". The Globe and Mail. The Woodbridge Company. Retrieved March 4, 2018. ^ "Common University Data Ontario 2017". University of Toronto. 2019. Retrieved March 17, 2019. ^ a b c Xuelun Liang (2012). "Facts & Figures 2012" (PDF). University of Toronto. Retrieved October 29, 2017. This page was last edited on 20 April 2019, at 20:11 (UTC).